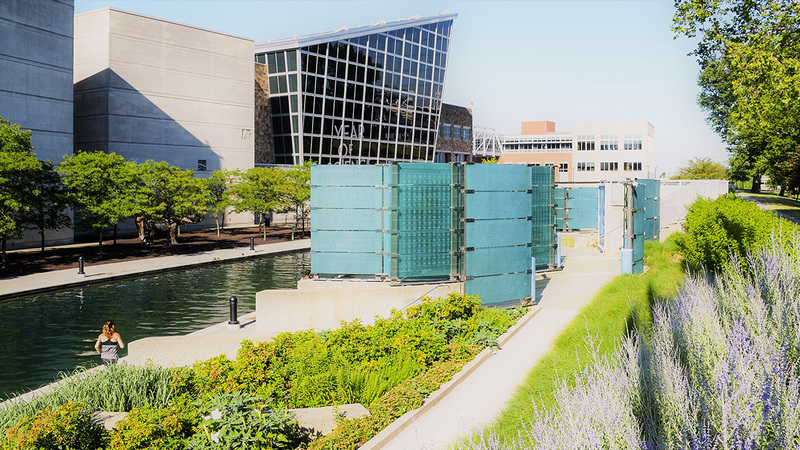 Located on a steep embankment at the northern edge of the Indianapolis Canal Walk, this is the nation's first memorial honoring the nearly 3,500 recipients of the Medal of Honor, the American Armed Force’s highest award for valor in action. 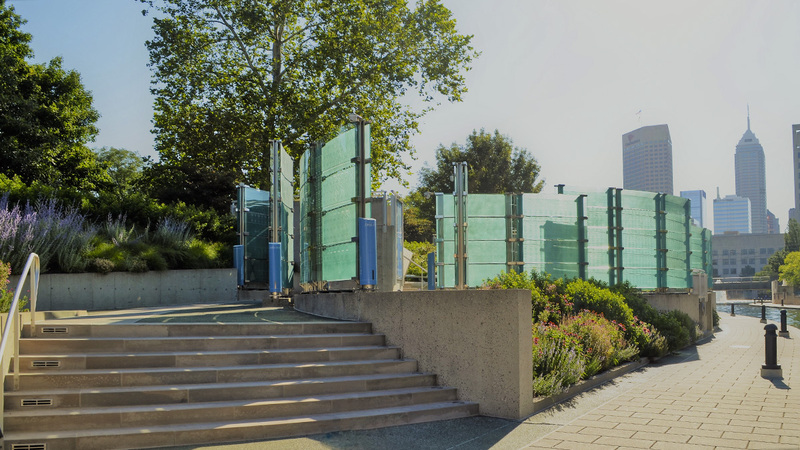 Completed in 1999, the memorial was commissioned by local businessman John Hodowal and his wife, Caroline, and designed by landscape architects Eric Fulford and Ann Reed of NINebark, Inc. 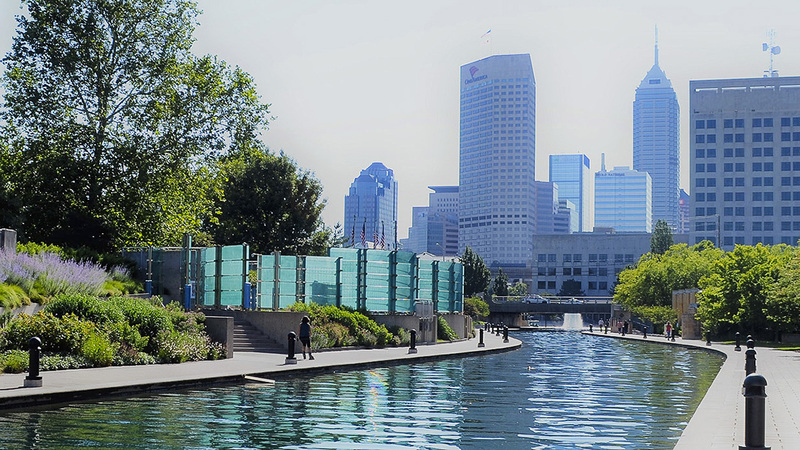 Situated within White River State Park, the memorial is sited on a narrow, sloping embankment 800 feet long and 48 feet wide at its broadest point, absorbing twelve feet of vertical grade change. Constructed of poured-in-place concrete taking the form of two overlapping semicircular arcs, and accessed by concrete ramps and stairs that mimic the design of the pathways in neighboring Military Park, the design transforms the topographically-complex space into an accessible and usable landscape. 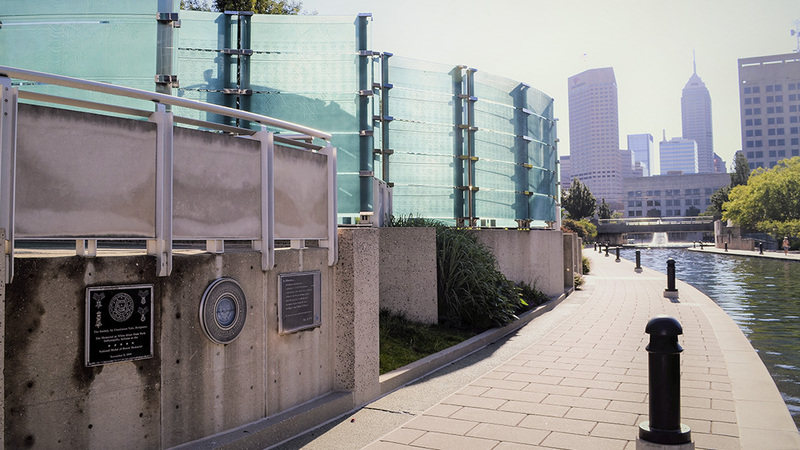 The memorial’s main gesture are 27 curved, blue-green glass “sails” ranging between seven and ten feet tall. 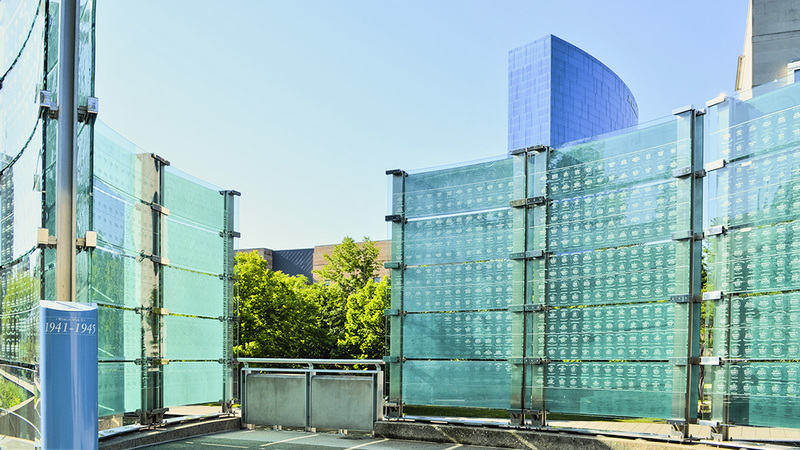 Beginning with the Civil War, fifteen conflicts are represented among the panels chronologically, including the names and stories behind each medal recipient etched into the glass. 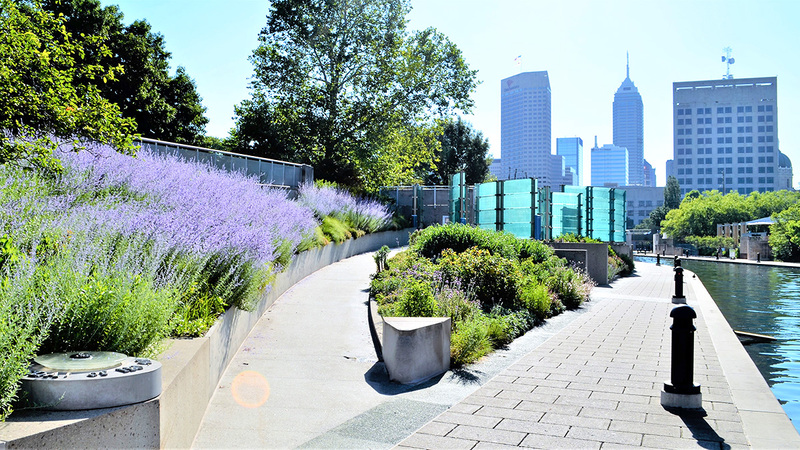 The memorial’s minimalist plantings include a small lawn terrace and dense perennials and ornamental grasses along its sloping edges that add seasonal color and texture. 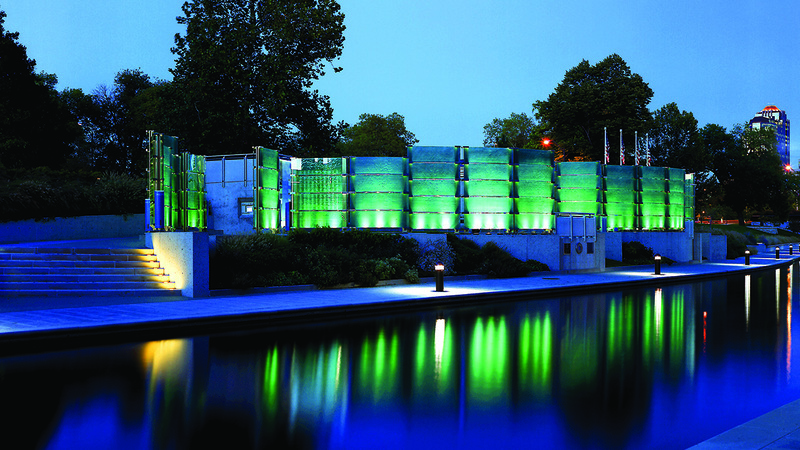 At dusk the structure plays 30-minute sound clips recounting medal recipients’ war stories, while colored lights illuminate the portion of the memorial illustrating the war or conflict being discussed. 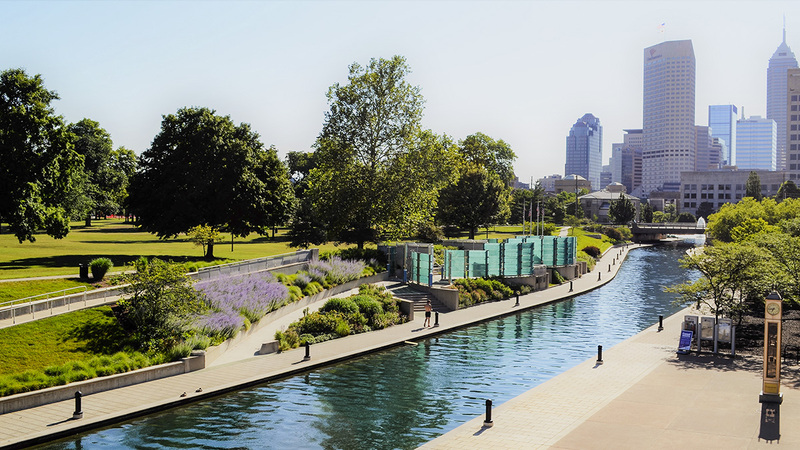 The memorial received the 2001 American Society of Landscape Architects Merit Award for Design.